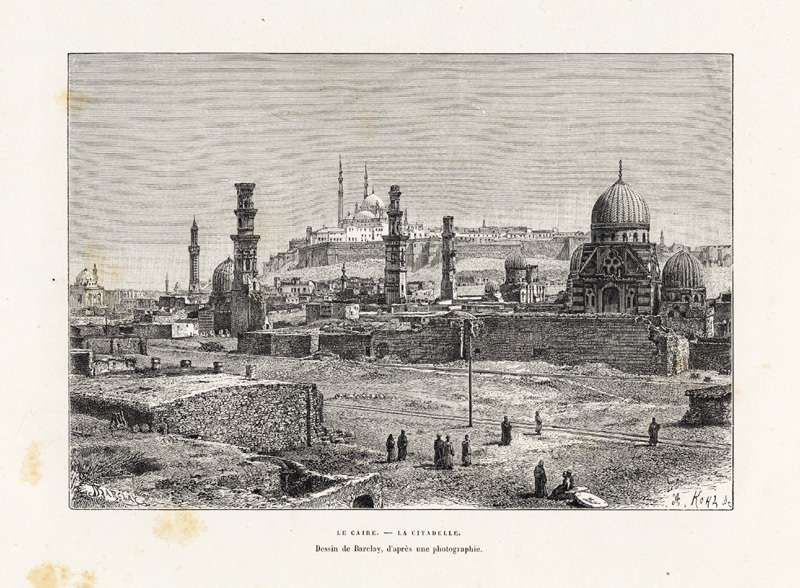 Subject: Plate : 'Le Caire - La Citadelle.' (View of the Castle of Cairo, Egypt). Condition: Good. General age related toning and light foxing. Please study scan carefully. Size (in cm): The overall size is ca. 26.5 x 18 cm. The image size is ca. 19 x 14 cm. Size (in inch): The overall size is ca. 10.4 x 7.1 inch. The image size is ca. 7.5 x 5.5 inch. Description: This original old antique print / plate originates from: 'Nouvelle Geographie Universelle La Terre et les Hommes X : L' Afrique Septentrionale' by Jacques Elisee Reclus, published in Paris by Hachette & Cie., 1885. Artists and Engravers: Jacques Elisee Reclus was a renowned French geographer, writer and anarchist. He produced his 19-volume masterwork La Nouvelle Geographie universelle, la terre et les hommes ('Universal Geography'), over a period of nearly 20 years (1875 ï¿½ 1894). This plate by A. Kohl after Barclay.